6 X 10 Victorian Floor Register - Brushed Nickel Discounts Apply ! Floor register covers with a brushed nickel finish will add that extra touch of sophistication to your rooms. Functional, stylish, durable and at a price you can afford. This heat register comes with a fully adjustable steel damper which allows you complete air flow control and lacquer coating to protect the finish and prevent rusting. Damper can be removed if desired. This heat register can also be used as a wall register. The register cover is provided with screws which can be used for easy installation onto the wall. You may use Spring Clips to attach the 6 x 10 brushed nickel floor register to the wall. 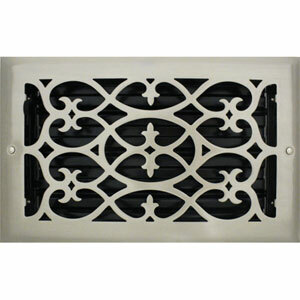 Decorative registers are a great and affordable way to enhance the decor of any home. Call in or order online to place an order today!